Windows 10 has been a critical success since its release, but if you need or want to revert to an older version of Windows, it’s easy enough to learn how to uninstall Windows 10 and roll it back to whichever version you prefer. Unfortunately, there’s no automatic system for older versions — you’ll have to back up your files, track down some installation media, and find your software key to get back to your “old” computer. Though the guide below is written with rolling back to Windows 8.1 in mind, the basic steps work for any Windows operating system going as far back as Windows XP — though we don’t recommend going that far back as Microsoft ended support for it some time ago. Be aware too, that new computers (particularly tablets) may contain components that weren’t manufactured when older Windows versions like Windows 8.1 or Windows 7 were being sold. If you do decide you want to roll things back and uninstall Windows 10, there are two distinct methods to do so. If you upgraded from Windows 8.1 or 7 within the last 30 days, there’s a simpler method of rolling back that takes very little effort, and doesn’t delete your files, which you can read about on the second page of this post. Most though, will need to actually install an older version of Windows or switch to Linux in order to uninstall Windows 10 without leaving behind a blank hard drive. Before beginning anything else, back up your important computer files to a separate location. An external drive or a cloud storage service is fine, so long as it’s physically disconnected from the Windows computer you’ll be working on. Unfortunately, Windows can’t preserve programs or settings when flashing to an older version (only a newer one), so you’ll also want to get installation media for any crucial programs, especially those that require serial numbers. It’s also worth noting that Microsoft doesn’t support Windows 8 anymore, only Windows 8.1, as it was part of an automatic update cycle. It’s also a good idea to download drivers for your computer’s various components before you begin the installation process. This will make it easier to get everything up and running if Windows doesn’t automatically select the appropriate drivers. Motherboard chipset, Ethernet, Wi-Fi, and graphics drivers, in particular, can make the setup process much easier. 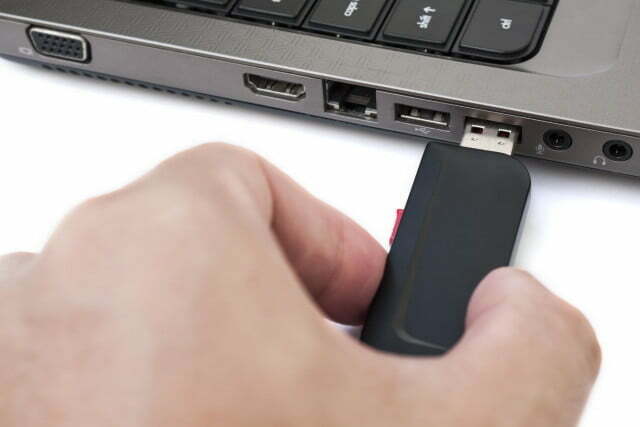 Store these drivers on a USB thumb drive for easy access once Windows is finished installing. Next, get installation media for Windows itself. For Windows 8.1, Microsoft provides a download service that allows you to send the installation files to a new DVD, or even use a flash drive. If you’re installing an older version of Windows, you’ll need the original disc (and possibly an external CD or DVD burner, if your newer laptop doesn’t have a disc drive). Alternatively, you can create a bootable USB drive with a Windows ISO. You’ll also need the Windows product key for whichever version you chose — this is the 25-digit code that came with your Windows retail box or purchase receipt from Microsoft. It may also be located somewhere on your computer’s case. While it may be starting to show its age, Windows 7 is still of occasional utility among power users looking to replicate or fix old software, or people who are just stuck in their ways. Windows 7 can’t upgrade, install, or keep files when installed on a system already running Windows 10, so a fresh install is the only way to achieve such a goal. Our guide to installing Windows 7 has all the links, detailed instructions, and a few caveats about using older operating systems that may help you troubleshoot esoteric issues. The Windows 8 process is much easier. Once you’ve finished backing up your files and programs, remove all other external storage drives, cards, or discs, and insert the Windows installation disc or drive. Restart your computer and boot it from that drive. The Windows setup process will then begin. For Windows 8.1, the first screen lets you select your language, location, and keyboard localization. Click “Next,” then “Install now.” Wait for the setup process to initiate. Click “I accept the license terms,” then “Next” on the license screen. The next screen has two options, “Upgrade” and “Custom.” Choose Custom — the Windows 8.1 installation system cannot upgrade from a newer version of Windows to an older one. On the next screen, the setup program will copy the Windows files from your installation media to your computer and begin installing the operating system itself. This may take quite some time, so if you’ve got something else to do for thirty minutes to an hour, it’s fine to leave your computer alone, so long as it’s plugged in or has plenty of battery power left. Keep an eye on the screen and return when the process is finished. Your computer may restart on its own. If you’ve utilized Microsoft’s free upgrade from Windows 8.1 or 7 to Windows 10, you can use a more automated process to downgrade your software from Windows itself. While this process is easier than the above because it will preserve some of your files, it’s always a good idea to back up personal data just in case something goes wrong. That’s an appealing option, but there are some caveats. The process used to work up to 30 days after the upgrade, but ever since the Windows 10 Anniversary Update that’s been reduced to just 10 days after the update. Some claim to have methods of extending that, but we wouldn’t rely on it. Regardless, after the allotted time, the operating system will delete the previous OS files to make room on the hard drive. If you’ve run Windows 10’s disk cleanup operation, it may have prematurely deleted those files already, but only if you ran it manually. 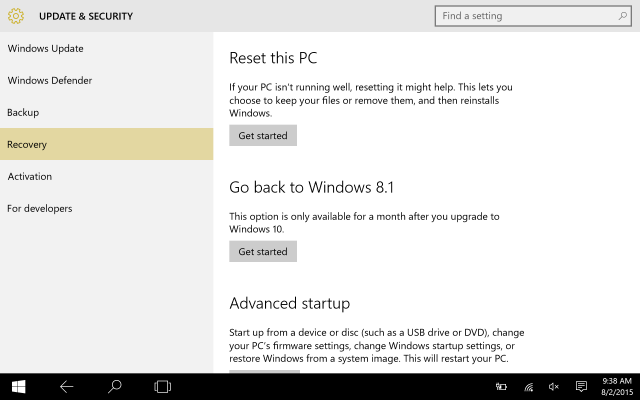 This process also won’t let you roll back to Windows 8, only Windows 8.1. Part of the Windows 10 upgrade process involves moving to 8.1, so that’s technically the last OS installed on the system. If you want Windows 8 proper, you’ll have to use the instructions up above, and even then, only if you have the original installation media, and turn off updates. 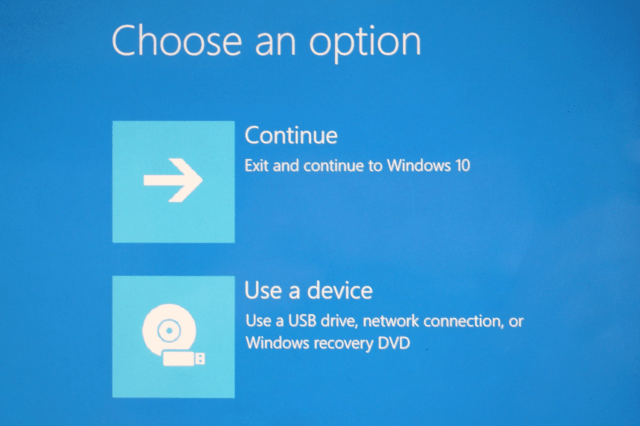 Go to the main Settings menu in Windows 10, click “Recovery,” then click “Go back to Windows 8.1.” or “Go back to Windows 7” and follow the on-screen instructions. The system will begin the process by asking why you’re rolling back to a previous version. Any answer will do, Microsoft is just looking for more information, and it won’t affect the installation itself. Then it will let you know your files will still be there, but you’ll have to reinstall applications, and any settings will be lost. You may also need your old password if it has changed since you updated to Windows 10. When you’re ready, click “Go back to previous Windows” and wait as the system begins rolling back. This will take quite a while, and the system will reboot frequently while working. This option is only available for the first month after upgrading, and isn’t compatible with previous versions of Windows (even the original Windows 8.) Microsoft’s process will preserve your local files, but not settings or third-party programs. Updated 12/14/2017 by Jon Martindale – Updated layout and links and clarified 10 day rollback window.